Get on the N2 highway then Witbank, Bethal, Emelo, Piet Retief, Pongola, Mtubatuba, St.Lucia. Turn left at the Mtuba turn off (road sign), turn left again at the next intersection. You will pass the town (on your right), you are now on the R618 to St.Lucia about 25 km further. Turn right at the traffic circle into McKenzie street and we are at number 154. 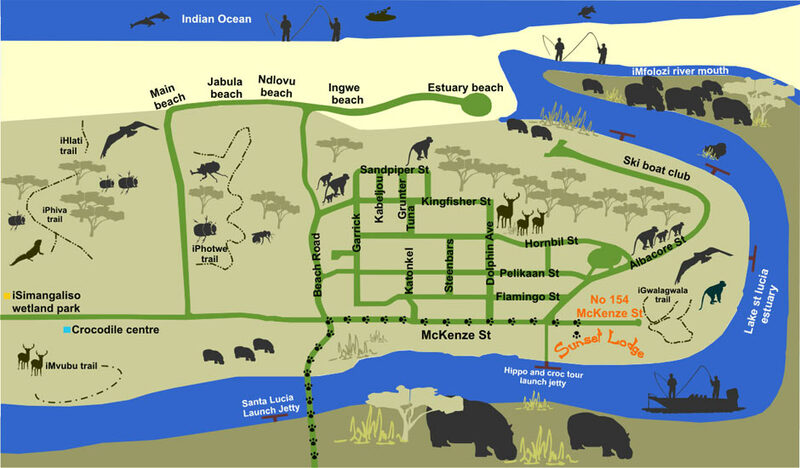 Get on the N2 highway and pass Richard's Bay and Empangeni. Turn right at the Mtubatuba turn off (road sign), turn left at the T-junction, turn right at the 2nd intersection. You will pass the town (on your right), you are now on the R618 to St.Lucia about 25 km further. Turn right at the traffic circle into McKenzie street and we are at number 154.